Casino Grand Bay is a breath of fresh air to US players. Running on BetOnSoft software, there are plenty of exciting slot machines and games to choose from. 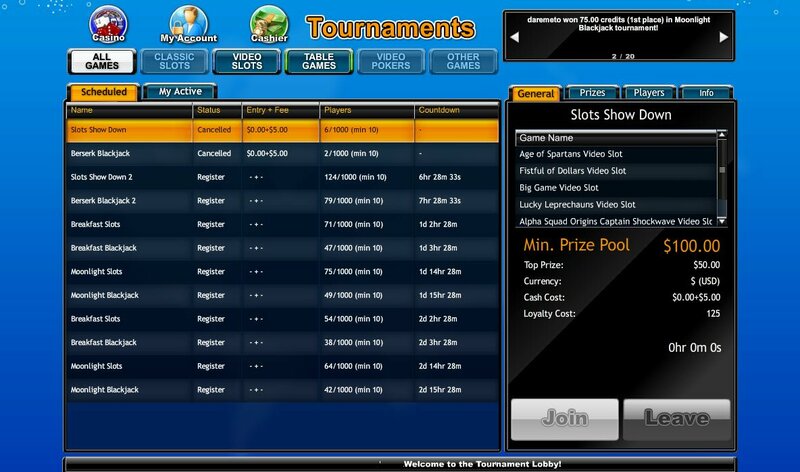 Helpful tips and useful information litters their casino lobby and website, plus there are always tournaments taking place, with wild jackpots up for grabs. At last, a US player friendly online casino! It seems to have been so long since I reviewed a casino where the words, "No US players accepted" weren't written. The Grand Bay Casino has been around since 2001 and is the flagship of the GP Group of Casinos. They are continually growing their range of HD games (currently standing at 140) and have an impressive Mobile Casino available, offering 40 HD casino games. Take to the seas and buckle up for the Casino Grand Bay review. 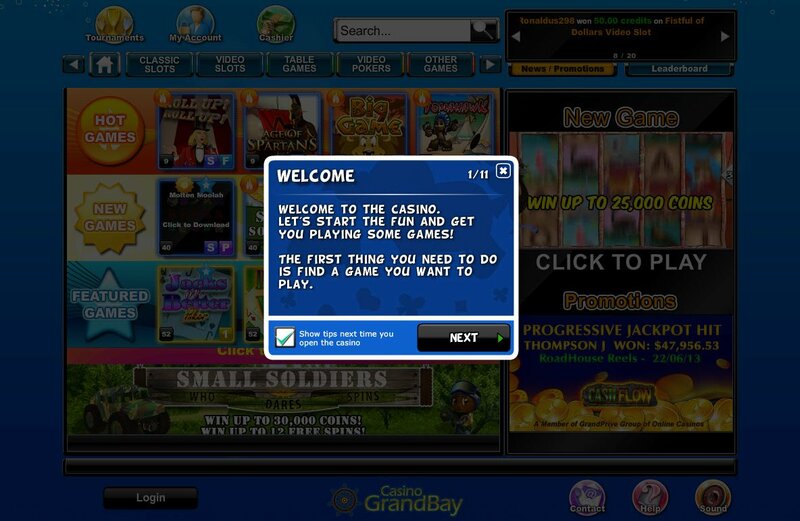 A simple choice of Download, Mobile or Browser greets you on the Casino Grand Bay homepage. As is my preference, I go straight for the download and am pleasantly surprised to be able to click on the installation within only a few seconds. I chose English, the default language for the casino installation, from several other language options and skim through the End User License Agreement, to make sure it is as standard (there are some perks to this job, and one of them is being able to recognise normal internet legal requirements and being sure I am safe to press "I Agree". As my installation continues, I see some statements from the online casino, letting me know they are based in Curacao in Netherland Antilles and giving me all the essential information I need to determine which way this casino review will go, good online casino or bad online casino? One thing is for certain: the BetOnSoft Casino Grand Bay software knows what is important to its customers and is very forthcoming on the issues that matter to us. Once opening your casino lobby, there is a handy virtual tour in the form of bubble thoughts, showing you where to look for BetOnSoft slot machines and games, promotions and the rest. The Casino Grand Bay Loyalty Programme will have you moving up the ranks, whilst you get your sea legs. There is also some delightful, Island type drum music playing, although after the third repeat, I had to mute it as it was interfering with my lobby exploration. The lobby itself is very easy to navigate, even without that extra help for first-timers to the online casino game. 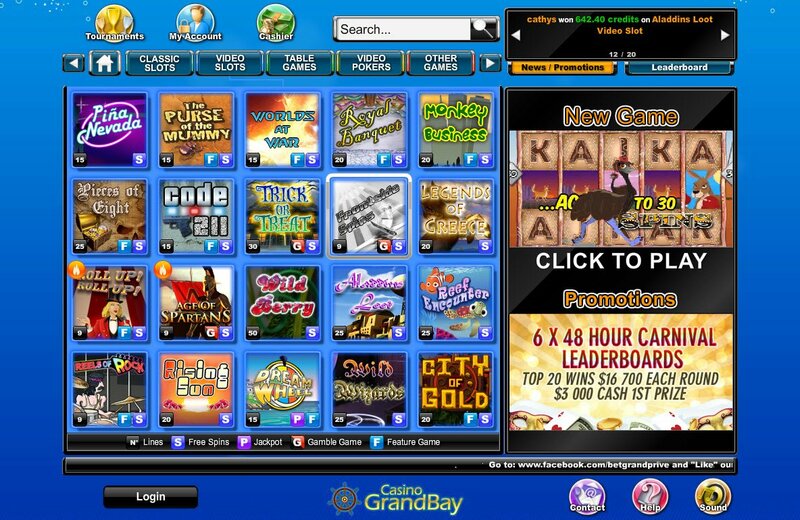 There are dozens of Casino Grand Bay Game Tournaments available to play and you can even choose to get in on the Jackpots in table games, not just on the video slots. There's a sublime current jackpot total of $/£162,715.23, which would certainly brighten up 2014 and even get many of us on our own boats to begin the role of Captain. Before we get too ahead of ourselves, let us check out the Casino Grand Bay welcome bonus offer. There's $/£100o free on offer, in the form of a Grand Bay Casino Welcome Bonus. This accompanies daily bonuses and exclusive offers, plus exciting free spin offers and Monday double uppers, along with Friday's Free Money. The Casino Grand Bay Loyalty Programme will have you moving up the ranks, whilst you get your sea legs. The tiers, named after the royal family of cards and aced by the Black Diamond tier, will provide rewards as per your rank. With Freephone / Toll Free numbers for the USA, UK, Italy, The Netherlands, Germany and France, you're just a phone call away from customer support. Add Live Chat, general enquiry and specific withdrawal email addresses to the mix, and you'll be covered. All the most popular payment methods are available here, with extra information from the casino on PaysafeCard, GiroPay, iDeal and Ukash. There's little chance of needing to refer to customer support as the lowdown on Secure Online Withdrawals from Casino Grand Bay is readily available, along with information on known credit card rejection issues.